It was a very special meeting for Lathom Abbey Lodge No 6286, held at Ormskirk Masonic Hall. After the WM Phil Stansbie had warmly welcomed 43 brethren to the meeting, he explained why. They were to initiate a ‘Lewis’. Pictured form left to right, are: Phil Stansbie, Andrew Mercer and proud father, John Mercer. Phil said it was a very special occasion and he hoped everyone would thoroughly enjoy it. 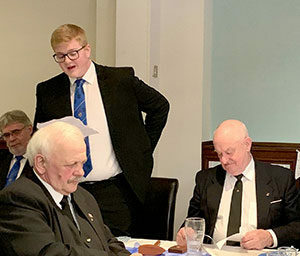 The lodge was then opened in the first degree and after the lodge business had been carried out, the WM announced the next business was to read a dispensation for the meeting. 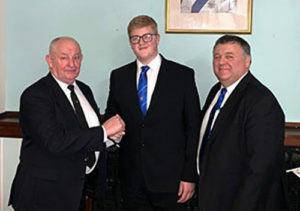 The reason for this was that the candidate to be initiated, Andrew Mercer is only 18 years old, and is the son of the lodge’s IPM John Mercer, who had proposed him into the lodge. The WM asked Bill Dutch to act as SW and John Mercer acted as JD for the ceremony, the candidate was admitted and the ceremony commenced. The WM carried out a faultless ceremony of initiation. Mike Smith delivered an excellent rendition of an explanation of the working tools. It must be said that the junior deacon, the proud father of the candidate, had a smile ‘as wide as the River Mersey’ all the way through the ceremony. On his return into the lodge, new initiate Andrew then received a faultless delivery of the ‘Charge after initiation’ from his seconder, Stewart Cranage who also happens to be Andrew’s uncle. The WM then formally welcomed Andrew and wished him every success on the start of his Masonic career. In the third rising the WM had a special announcement to make. He informed everyone that on the morning of the meeting, the lodge secretary, Stewart Cranage, had received notification from the ‘Chamberlains Court’ informing him that they had passed an order for his admission to the ‘Freedom of the City of London’. This is to be conferred in April. News of this honour received rapturous applause from the brethren present. Andrew Mercer responding to the toast to his health. Everyone then retired to the dining room to enjoy a fantastic meal consisting of, black pudding stack, beef shin and cheek pie, followed by black cherry and brandy topped cheese cake. Phil Stansbie, during his response to the toasts, informed everyone that the sponsored bike ride he had undertaken on his 80th birthday, had raised £1,000 and it was his wish to divide the donations equally between the hall and the MCF 2021 Festival. He received hearty congratulations and thanks from the brethren. At the completion of the excellent festive board the brethren of Lathom Abbey were joined by their ladies to round off what had been a most memorable and enjoyable evening.